The recent “news” about Coconut Oil may be inflammatory, but the oil is not. Well, it’s sure not “poison”. Coconut oil has some palmitic (C16) acid, but also myristic (C14) and lauric (C12) acids. These fatty acids when free (non-esterified) are inflammatory, but in coconut oil they bound to glycerol, they are not “free”. They raise serum LDL levels, but the large buoyant, not the small dense LDL (the bad kind). There are benefits to medium-chain triglycerides (MCT’s), but coconut oil’s fats are larger than MCT’s. So coconut oil is no worse than saturated fat, and saturated fat has been shown to be neutral for CV disease and diabetes. 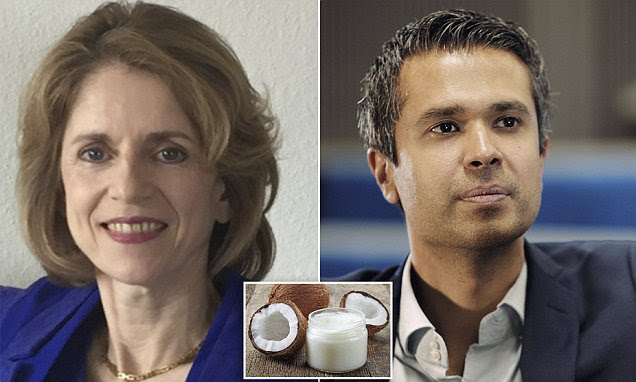 EXCLUSIVE: In a scathing video, Dr Aseem Malhotra, a former cardiologist at Frimley Park Hospital in Surrey, called on Professor Karin Michels to apologize for her ‘entirely false’ claim and to retract it.